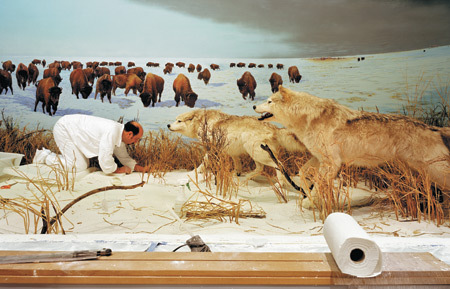 To equate natural history dioramas with nature is a bit off, I know, but that seems to be Barnes’ position. I heard the photographer speak recently at Philadelphia’s Academy of Natural Sciences — the nation’s first natural history museum. The institute has its own collection of dioramas, 37 made in the 1920s and ’30s featuring birds and mammals from North America, Africa, and Asia. Barnes has long had an interest in museums and collecting and history. 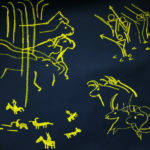 He’s documented archaeological excavations in Egypt, the renovation of San Francisco’s California Palace of the Legion of Honor art museum, and skeletal mounts of animals. 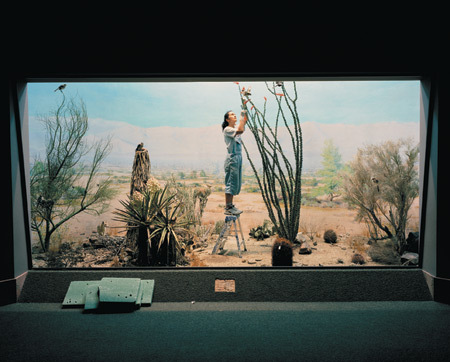 Barnes’ photos of natural history dioramas, he says, highlight the objects’ artificiality and the theatricality of display. This supposes that the artifice of dioramas is otherwise subsumed. I find this a surprising position in 2010, if not a surprising approach. Acknowledging the artifice of dioramas has been en vogue for several years now. 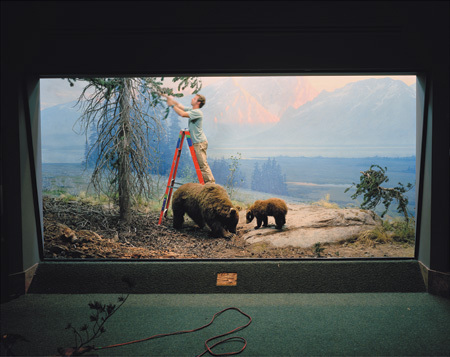 In 2006, a diorama artist for New York’s American Museum of Natural History released Windows on Nature, a behind-the-scenes look at that museum’s famous displays. The dioramas as display objects have their own page on the museum’s Web site, where they’re touted as “renowned” and “beloved” — not the kind of language used to describe objective conveyors of knowledge. Do people talk about any other kind of museum exhibit that way? A touch-screen display on the heart? The signage accompanying a mineral display? No. Not today at least, since those things still function as learning tools. For dioramas, that role is long gone. On the site, the Museum’s chairman describes the dioramas as “amazing technical feats of illusion.” But once the Museum identifies these as illusions, and invites you to see how the illusion is created, you know that they know the jig is up. Give them credit, at least, for running with the idea. 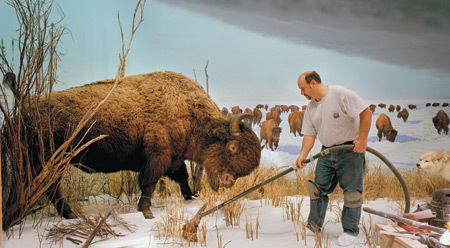 In addition to the book, the Museum provides 360-degree virtual tours of its dioramas. A look at the bison and pronghorn display opens with a view of the bison, and then spins on an axis of the glass dividing the diorama and the public space to reveal the Alaska brown bear in the distance, the Alaska Moose immediately opposite, and other displays further on. You, the viewer, do not assume your normal place in front of the display, but you don’t lazily jump inside, either. The view positions you right at the interface between the two, which is pretty awesome, for a science museum. Of course the thing about dioramas is that for all their power as symbols of science museums, they have strong nods to their art counterparts. This is not to say what’s obvious — that their rectangular proportions suggest works of art, that benches in the center of their halls suggest the kind of reflection one is more likely to have before “The Artist” than in an exhibit on Darwin’s childhood. 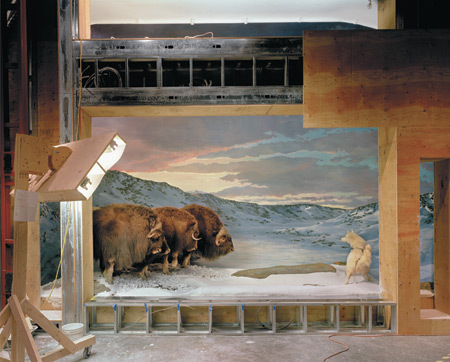 Rather, it’s to say that issues of art and science, and art versus science, often come up in discussions of dioramas. 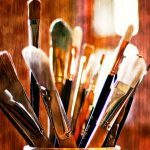 The Academy describes its dioramas as “a distinctive fusion of art and science.” In other words, these are two distinct realms that can be fused while still remaining separate. The diorama becomes a kind of trail mix in which the individual components can be picked apart. This seems to be a given. At Richard Barnes’ talk there, a member of the audience asked, “How do you balance science, which is about truth, with art, which can do whatever it wants?” Barnes gave a kind of general answer about how it is, indeed, a balance. If I’m disappointed with this new eye to dioramas, it’s only because it reinforces their trail mix nature, when I like to think of the displays more as a kind of irreducible brownie. Thinking of them as the latter could help reduce the conceptual boundaries between art and science, reduce the idea that one borrows from the other (take a look at the new decorating aesthetic that draws on 19th-century natural history conventions, apartments full of taxidermied animals and scientific illustrations that suggest not power or intellectual pursuits as they originally did, but the overt intellectual power and financial means to make such allusions through design). Paradoxically, the pleasure I receive from the artifice of artificiality is receding as the simulacrum gets closer to looking like the real thing. Without doubt this tree’s descendants will soon look more convincingly real, but the engineers of these trees will always strive toward invisibility — toward matching reality — rather than following the artist’s “Look how close I can come” demiurge. This new recognition is racing in the opposite direction, from the real thing (the diorama) to overt simulacrum (a photo of a diorama that reveals its diorama-ness). In both cases, the object under consideration is rendered uninteresting. To say “This tree is real” and “This diorama is fake” is to strip the tree and diorama of any kind of complexity. It’s as uncompelling as saying a cell phone tree is fake, or that a diorama’s scene is real. Intriguing questions — what is this supposed to do? why does this scene look the way it does? why is the perspective painting so bad? what’s suggested by the larger museum space? 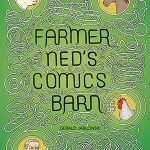 how does this space make me feel? — fall away when the diorama is reduced to quaint artifact. Which is why I love the Academy of Natural Sciences. It’s not willing to throw in the towel, as the American Museum of Natural History has done. On its site, the Academy budges very little: “Although their magic has diminished somewhat with the advent of television and the internet, dioramas still provide an opportunity to experience these magnificent animals up close.” I don’t know if the Academy really believes this, or it just wants me to. It honestly doesn’t matter. I prefer to be the one stepping back to judge these on their own terms, and the Academy lets me do that.